I could draw comfortably with the Flip on my lap for hours. Running the Clip Studio Paint UI in small mode still provides reasonably sized icons and touch targets. It's irresponsible to post a hardware review based on a single use case, but a lot of you have been clamoring for my verdict on the Sony VAIO Flip 15A convertible since I unboxed it Sunday. This post is based on just a few hours' worth of work on the system, so I reserve the right to change my mind. And as I test other applications, my judgement may change. If you don't use Manga Studio or its Japanese twin Clip Studio Paint, move along there's nothing to see here. I intend to test other apps on the Flip, but it will take a while as I still have a lot of installing and testing to do on the Surface Pro 2. Licenses and activations for most high-end programs being what they are, it's not a trivial matter to try to test on a growing number of devices. If you are a Manga Studio/Clip Studio Paint user, I think you will be very happy if you decide to go with any of the Flip models. I've been performing all my recent hardware tests with CSP 1.2.7, which is downloadable from the Celsys website. This is virtually identical to MS 5.0.3 and I'm using the former only because of the convenience of downloading the trial onto new hardware. To sum up my first impressions: the Flip is a beautiful machine. I love the brushed aluminum finish, although it is a fingerprint magnet. I like the thin profile, light weight for a full laptop and solid construction. The one nitpick I have on construction is a hinged plastic attachment on the Ethernet jack. I'm not sure why Sony engineered the port this way. It seems likely to snap off at some point down the road and isn't flush with the bottom of the case when a cable is attached. I was surprised that the keyboard is backlit, which is a very useful feature in low light. The keys are very nicely spaced, although their profile is a bit low and too flush with the keyboard for my tastes. The touchpad is very roomy, but like all Windows trackpads I've ever used, it doesn't compare with a MacBook for silkiness or responsiveness. One by-product of the touchpad's size is that I occasionally right clicked when I thought I was left clicking; your thumb really needs to travel some distance to get from one side to the other. The flipping mechanism is very sturdy but sometimes awkward to use. The laptop is particularly stiff to open. Perhaps this will loosen over time, but it always takes few seconds to figure out where to apply pressure to lift the screen either from a close position or from tablet mode back into laptop mode. On the other hand, it's very easy to go into presentation mode, which is great for watching videos. I'm sure that will come in very handy on a plane. The screen orientation sensors don't always work and the screen has gotten stuck upside down or in portrait mode for a while. The behavior is intermittent and never lasted very long, although I can't reliably recall how I corrected it. This sometimes also occurs with the Surface Pro and the resolution usually involves some violent shaking to get the sensors to notice the change of orientation. The active pen (sold separately on all but the highest end configuration) is surprisingly solid and comparable with the Wacom Stylus Feel. It has two button for those of you who crave that control, but it lacks an eraser tip. The buttons are flush with the pen, so it's too easy to push them accidentally. I complained yesterday about the fan noise and I hope that Sony addresses fan speed with a future firmware update. I originally tested the Flip on my living room sofa with no other equipment running and the fan noise was almost unbearable. But working in my noisy office environment this morning, the fan was not a dealbreaker. In fact, I don't believe they kicked on at all while running CSP for a couple of hours. I was about to give the fans a pass until I had to install today's extensive number of Windows updates. The fans kicked into high gear during that process and no amount of noisy office gear could drown out this high pitched whir. Fortunately it seems that CSP doesn't push the cpu temperatures high enough to trigger the fans, bu you will want to keep your noise canceling earphones handy if you plan to use the Flip for anything cpu intensive (no joke!). And don't be surprised if other members of your household or office colleagues ask you to work outside. Pens and sensitivy are a highly subjective topic. Your mileage may vary, but in my opinion, the active pen performs very well in Clip Studio Paint. The range of pressure sensitivity is definitely less than on the Surface Pro or my Yiynova MVP22U tablet monitor, but it is still very usable. It takes a bit more pressure for light marks to show up and it requires more control to demonstrate more than a few variations of pressure. One distracting "feature" when drawing is that I've found small areas on the screen where the pen tip will drag more than in others. This doesn't seem to affect the accuracy of the drawn line, but it is a little jarring to suddenly hit a pocket of resistance. The problem seems to be exacerbated when working at higher magnifications. Any N-Trig users see similar behavior in other devices? Another interesting difference that I noticed between my other devices and the Flip is that pen stabilization seems to work differently. I regularly crank it up to 90 on the Surface Pro to smooth out my shaky lines. Turning up the stabilization that high on the Flip makes it impossible to draw reliably. Turning the stabilization down to the defaults of 10 or 15 delivers the desired smooth results. Calibration out of the box was very good except that I can't trigger the desktop taskbar to unhide with the pen. The cursor rides several pixels above the very bottom of the screen, so unhiding the taskbar requires a finger. I tried a couple of times to compensate with the calibration tool, but that impacted the cursor's accuracy elsewhere on the screen so I reverted to the defaults. Portrait mode is comfortable in your lap too, but the long and narrow 16:9 aspect ratio isn't ideal. The weight of the Flip 15A isn't an issue so long as you don't try to hold it or cradle it in your arms. Using it as a lapboard feels natural and totally comfortable. I could work like this for hours on end. The size of the workspace never feels cramped and you can even leave the CSP interface in small mode. All the touch targets are still very easy to hit with a high degree of accuracy. Flipping the device into portrait mode still works on the lap, but suffers slightly from the rectangular 16:9 aspect ratio. There's something about working in this elongated mode that just doesn't feel right. Spending $1300 on a pc to run just one application may seem absurd, but I know many of you earn a living with Manga Studio or Clip Studio Paint. For those of you who haven't committed to a Cintiq Companion or larger tablet monitor, the Flip 15A is definitely worth your consideration. I'm not sure if I will keep the Flip 15A yet. Besides a fix for the high fan speeds, a lot depends on how well it performs with other software, especially Photoshop. I'm surprised that I prefer the Flip's screen size to the 22-inch Yiynova tablet monitor, which is almost too big. Also, it's very nice to have multi-touch available in front of you as you draw (the Yiynova doesn't support touch input). Engadget has just published the first review of the new Sony VAIO Flip 15, the Windows 8 convertible laptop that offers the biggest active digitizer short of a dedicated tablet monitor. This is a gorgeous machine and surprisingly low priced for its specs. The N-Trig equipped 15A is now available for pre-order for $1799. I played with two current generation N-Trig equipped systems at the local Sony Store last week and was very disappointed with the accuracy running Fresh Paint, the only program available to test. I'll definitely go back once the Flip 15A is released to give it a thorough test. So what do you think? Do the 256 levels of pressure sensitivity render this laptop useless for artists or does the large screen size make up for it? UPDATE October 16 Sony offers a 1920 x 1080 version of the Flip 15A that retails for $1290 after inclusion of the optional Active Pen. I had a chance to go back to the Sony Store yesterday and installed the Clip Studio Paint 1.2.7 English language demo on a Sony VAIO Duo 13 and it ran flawlessly. I'll admit I may not be the best judge but pressure sensitivity felt about the same to me on the N-Trig than it does on my Surface Pro. The Sony Duo is bundled with ArtRage Studio 3.5 and its palm rejection is horrible. According to this thread on the ArtRage community site, the company has recently issued a free update the older software which may correct the problems I saw. The paid upgrade to the current version may also address the issue. Other users have complained about N-Trig compatibility with Photoshop, although Wintab drivers are reportedly available at N-Trig.com. (I couldn't find Sony-specific drivers there). 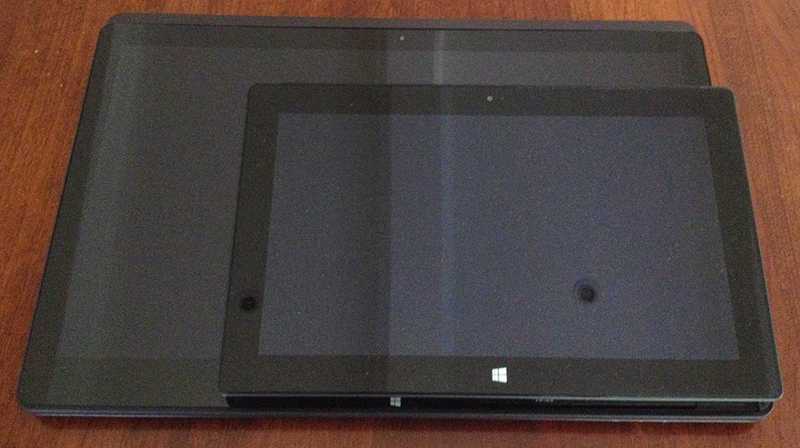 Digitizer preference aside, the Flip 15A or any of its Haswell brethren clearly outdistance the Surface Pro 2 spec-wise. So bottom line, if you're only interested in working with Manga Studio or Clip Studio Paint, the Sony VAIO Flip 15A is a real option. If you need compatibility with other graphics applications, the situation is much murkier. Sony VAIO Duo 13 running Clip Studio Paint 1.2.7. Wacom digitizer isn't missed at all.